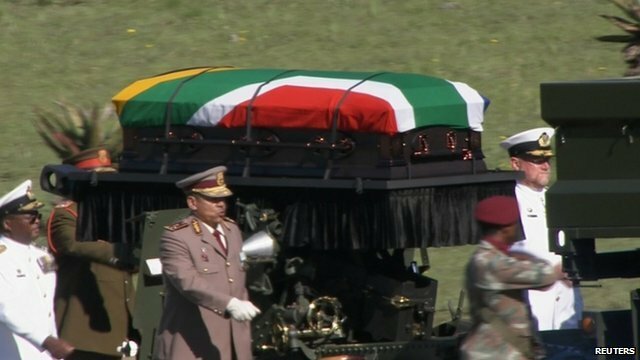 Nelson Mandela’s state funeral is taking place in his ancestral home in Qunu, ending a week of commemorations for South Africa’s first black president. Some 4,500 people – including foreign dignitaries – are attending the service, which blends state ceremonial with traditional rituals. Nelson Mandela died on December 5 at the age of 95. Members of his family attended an overnight vigil, with a traditional praise singer believed to be chanting details of his long journey and life. The coffin was taken on a gun carriage from Nelson Mandela’s house to a giant white marquee that had been specially erected. The state funeral started shortly after 08:00 local time. Inside the marquee, Nelson Mandela’s portrait had been placed behind two rows of candles, on one of three stages. After the national anthem, Nkosi Sikelel’I Africa (God Bless Africa) was sung, the service heard from a family spokesman, Chief Matanzima, who praised the army medical team that had treated Nelson Mandela before he died. Two grandchildren then addressed the congregation. Listening to the tributes were Graca Machel, his widow, and his second wife, Winnie-Madikizela Mandela, who sat either side of President Jacob Zuma. African National Congress members, veterans of the fight against apartheid and foreign dignitaries – including several African presidents, the Prince of Wales – are among the guests. Archbishop Desmond Tutu – a long-time friend of Nelson Mandela – is there, having earlier said he had cancelled his flight as he had not received an invitation. Talk show queen Oprah Winfrey is also present. Some guests have been singing and dancing to celebrate Nelson Mandela’s life. An ox will be slaughtered. A family elder will stay near the coffin, which has been draped with a lion’s skin, to talk “to the body’s spirit”.